sensational clubs. Have had VFT Pro Series Driver and looked for Fairway woods for 2 years and found the 3,5 & 7 the other day and got them cheap with a reg sahft and i hit everything with a draw no matter what i use. These are the best woods i have ever hit and would recommend to anyone who wants a serious wood. 6 Years old now and still as good as any current club on market in my oponion that i have hit. I played with Callaway VFT 3, 5, 7 woods stock R flex shaft for the last 4 years now and just purchased a 9 wood from ebay last month. These woods are so easy to hit, fly high and land soft. Excellent clubs. Have not need to use it. One of my favorite clubs is a Steelhead 7 wood. It replaced my 3 iron years ago and to this date I have not found a hybrid, fairway wood or 3 iron toreplace until I was lucky enough to find a VFT 7 in excellent condition on ebay. It has the standard Callaway 60 firm graphite shaft. It now completes my set of VFT fairway woods3,5&7. I've tried all the major manufacturers lastest offerings and still go back to these because of their distance, accuracy and feel. Probably the best fairway woods Callaway ever made in my humble opinion. I've tried a number of different 3 woods -Titleist 980, Mizuno Blue Rage, Taylor Made 300, Cobra SS-Steelhead over the last few years and now have gone back to the VFT. For my swing the ball comes off with a nice draw and trajectory. It has the Callaway System 60 firm flex shaft. In the other clubs I've tried different shafts- Aldila NV, Graphite Design etc and still none of these other clubs and experiments I've tried seem to match up to the VFT. I tried the GBB II and still feel more comfortable with the VFT. Recently purchased this club off ebay.If you have trouble with fairway or hybrid club going to the right of the fairway too often,try this club.I'm hitting this club straight and long.This VFT is great.I can't believe Callaway does not make it any longer.I probably will get a VFT 7 wood soon. After years of searcing for a 3 woods which worked for ME - found this one in a close out bin. Perfect from tee and turf. I've had these clubs for a year and half. I've studied the reviews on these clubs and have found that because people are hooking the ball that they think the club face is closed. It's not a closed club face, research it. The shafts of these clubs aren't like others. The stiff shaft is really like a regular shaft. I had the stiff stock shaft and had to replace it because I was hooking the ball, that's what happens when you swing speed is stronger than the shaft flex that you are using. Ask a Pro that knows and they will tell you the same thing. Those of you that are hooking the ball should change to a better quality shaft and you will get great results. The clubface is very hot. I didn't like having to replace the shafts but it was worth it. Have read most of the reviews on this club and think if now for a very few very low scores it is very well received. I hit straight and the trajectory is higher and the roll longer than old 5-woods. Callaway Warbirds, Steelhead and SH Plus and Ping TiSi. About 4 years ago I purchased a VFT driver and was very pleased. So then went and bought the 3 and about 6 months ago I purchased a #5 through golfclubexchange for considerably less then the others. 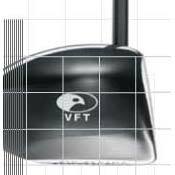 I've sold the driver as I recently purchased a 983K which is longer and more accurate then the VFT. I hit the 3 about 230-240 yards and the 5 about 10-20 yards shorter and both are very accurate. I also have the TM Tour 3 and 5 woods which are about the same distance and accuracy wise but have a different trajectory. All have stiff graphite shafts. I don't see any reason to change as these clubs complement my iron distance.